I've got another card to add to my stash of Christmas cards. It's a good feeling to get ahead. I used an image from Paperworks Co. I love this snowman and his little friend. 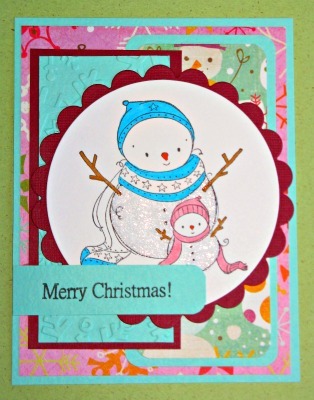 It's quick and easy to color and works in so many card layouts. I added some sparkle with some frosted lace stickles. I added alot of layers to this card, and texture with my cuttlebug folder. Lovely snowman image. Thanks so much for joining us at Simon Says Stamp. wonderful sweet card ! !thanks for joining in our challenge. Thank you for playing along with the Magical Monday Challenges. Unfortunately, you didn't use a Magical Character (Angel, Fairy, Mermaid, Dragon, etc...) so it does not qualify for the challenge. There will be a new challenge tomorrow if you would like to play along again.